Each year at Easter vigils, these words pierce the darkness as Christians gather around the lighting of a large candle. This candle is the paschal candle, sometimes called the Easter candle or Christ candle; its name comes from pasach, the Hebrew word for Passover. Congregations may have different Easter celebrations and very different-looking paschal candles, but the meaning and symbols are universal. After a period of darkness beginning on Good Friday, congregations first light this candle during their earliest Easter celebrations, signaling Christ’s banishment of death and darkness. This tall white candle represents Christ’s steadfast presence in our midst, and its flickering flame dances with light and warmth, illuminating our shadowed world. We continue lighting the paschal candle each Sunday throughout the Easter season, with most congregations continuing to light it until Ascension Day. Just as we light the paschal candle at the beginning of life, so, too we light it at the end of life.Its presence at the head of a casket or beside an urn reminds us again that Christ triumphed over darkness and death and that even in death, there is brilliant life. A central cross identifies it as the Christ candle, and its flame burns despite the death Christ endured. Many paschal candles also have five nails with incense inserted into the center and four endpoints of the cross to represent Jesus’s wounds. The letters alpha and omega, which begin and end the Greek alphabet, signify that God is the beginning and the ending of all things, and that the Word of God is present from creation until the end of time. The current year indicates that God is present not just at the beginning and the end of time, but throughout history and among those gathered here and now around the candle. Because the paschal candle represents Christ’s presence in the midst of those who gather around Word and Sacrament, it is appropriate that the candle should fit the character of the people who gather and the place where they worship. Finding an appropriate candle for your congregation can be as simple as exploring the options available through religious vendors, who offer a wide variety of candle designs ranging from simple to ornate. Although some congregations purchase a new candle each year at Easter to represent the new life of Christ, other congregations keep the same candle for several years and use the decals that come with it to change the year markings. Involving artists from your congregation to design a unique paschal candle can lead to a piece of liturgical art that is both aesthetically pleasing and personal to your church family. 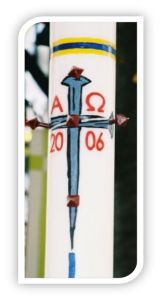 An artist in your congregation or a professional can paint a plain white candle with the personalized design. Congregations can also make a more vivid and lasting design by carving their design into the candle and filling it with colored wax. Although this method is time consuming, the steps are quite simple and yield a beautiful candle. Whether your congregation chooses a refillable paschal candle, one with a store-bought design, or a unique piece of art, take the time to look closely at it and consider what the design means to you and your church family. Enjoy the warmth of its light and the brightness that it brings to your life and the lives of others through you. Visit our How to Carve Candles Page to see how you can make your own, or visit our Internet Links Page to see the wide selection of designs produced by the manufacturers listed there. 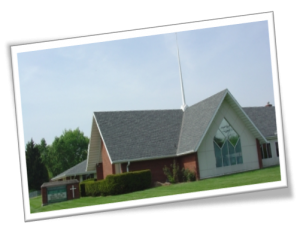 The Evangelical Lutheran Church of America has put out a resource called “How do we use a paschal candle” that goes into much greater depth about the history and use of the paschal candle, and provides additional resources about worship and Easter traditions, as well as other frequently asked worship questions. An excellent resource for planning worship during Lent and Holy Week is the “Worship Guidebook for Lent and the Three Days” by Augsburg Fortress.